At the Colorado Springs Fence Company, we build high value, custom designed fences for qualified homeowners and businesses across the Front Range and Pike’s Peak region. The company was founded and is operated by Josh Osborne. Josh carries, and has instilled in his team, a passion to serve with an extreme attention to detail. The goal is to build lots of quality fences across the Front Range for totally satisfied customers that have received personal, exemplary service. Colorado Spring Fence Company is Licensed and Fully insured with General Liability and Workers Comp coverage. At Colorado Springs Fence Company, we can meet just about every fencing need of any well qualified client in Colorado Springs, Pueblo, and across the front range and Pikes Peak region. Lots of certainly isn’t a sophisticated term, but it does hold out a big promise for you. Of course we welcome and respond to homeowners and business owners with standard fencing needs; but maybe you are facing a particularly challenging situation? Josh and his team want you as a satisfied customer too! We have the experience, creativity, and resources to meet just about any fencing need. Do you face unusual terrain, specific aesthetic, or precise HOA requirements? Maybe you are worried about needing a quick turnaround, or have other special working-fence requirements? If so, you’re someone we want to turn into a satisfied Colorado Springs Fence Company client. Here’s another simple word holding out another big promise. When is the last time you were truly satisfied with a product or service you received? We promise that you will be when you deal with Colorado Springs Fence Company. Check out the customer reviews we have earned on Google+. They speak more eloquently than we can. Our growth and security is built on satisfied customers. Click here to fill out this online request form or call us today at 719-439-2703. Estimates are free and can often be completed conveniently over the phone in many situations. We’ve been working both hard and smart since 2004. That means your job will be completed to exacting quality and safety standards in the shortest time possible. Thanks for considering us. We are Colorado Springs Fence Company. We are big enough to provide any style fence you might need or desire. At the same time, we are personal sized. This means that every customer and project—including you and yours—receives the personal attention required to be completed in a timely, successful, and truly satisfying way. It’s not just customer satisfaction in general, but it’s your satisfaction that matters to us here at Colorado Springs Fence Company. Josh first began building fences in Colorado Springs with his dad Mike when the two of them started A Beautiful Fence Company of Colorado. Later business expansions added experience and led to A Beautiful Deck and Fence Company. Together, Josh and Mike along with several great employees built fences of all types all along the Front Range from Pueblo to Denver. In 2010 Josh switched from full to part-time fence work for a season to allow time to serve those in need locally by founding the ministry, More Than A Meal. After a successful few years the ministry was handed off to one of Josh’s ministry partners. It continues to serve those in need in Colorado Springs today. 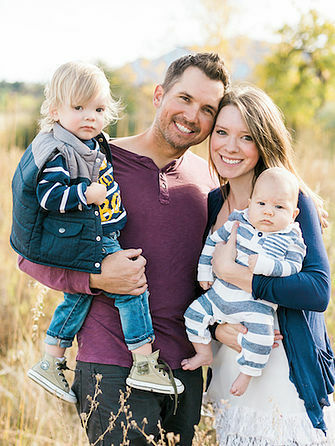 Around that same time, Josh met his soon-to-be wife Cassidy they married and began a family. The company was founded and is operated by Josh Osborne. Josh carries, and has instilled in his team, a passion to serve with an extreme attention to detail. The goal is to build lots of quality fences across the Front Range for totally satisfied customers that have received personal, exemplary service. Please consider calling Colorado Springs Fence Company at 719-439-2703 to bid on your next fence project. You can also fill out our online request form. Both will begin the process to help you experience for yourself the outstanding quality and service that so many in the Colorado Springs and surrounding areas have come to expect from Josh Osborne and the team at Colorado Springs Fence Company.